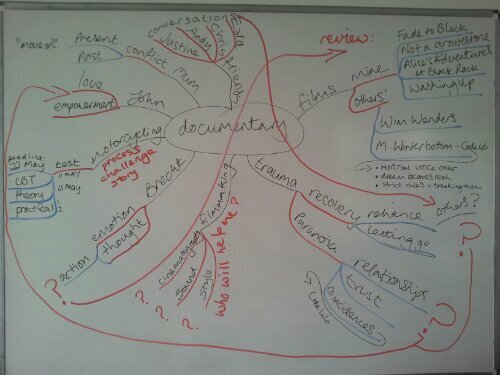 The film idea I presented at the Reconfigured Documentary briefing this morning was encapsulated in this photo of a mind-map I made. Threads I wish to explore in my documentary are my relationships with John (my boyfriend), my friends, my family, motorcycling and my previous films in connection with empowerment and healing from trauma experienced in childhood. I would like to utilise re-enactments, photographs, archive footage and digital SLR footage. The bass-line for the film is the narrative of me passing my full motorcycle test by the end of the film. My CBT (Compulsory Basic Training) is fixed for Saturday 11 May 2013; my theory test is booked for Tuesday 14 May 2013, and once I have passed this I can book the Module 1 Practical Test – off-road manoeuvres. John is training me in the Module 1 manoeuvres. I’ll need professional training for the Module 2 Practical Test as this involves riding on public roads. My funds are limited hence the creative approach to training. As I shared this information with the class, I realised my father is not mentioned in the mind-map. I asked, out loud, “where is my dad in this?” My immediate emotional response was tearful. I wondered about the use of voiceover and who I might address it to – the audience? My dad? Myself? The idea of a voiceover addressing a specific person reminded me of a story I wrote from the point of view of Death as a character. I showed the first fifteen minutes of Michael Winterbottom’s Code 46 to the class as an example of some of the things I’d like in my film: Samantha Morton’s voiceover addresses the male lead from the present – the visuals depict the past but we’re seeing it in the present. I like this use of temporal anomaly. Judy, my tutor, showed an excerpt from A Question of Distance by Susan Tramwell, who uses voiceover that is specifically addressed to the people she has interviewed. Although she speaks with little emotion in her tone, there a sense of poignancy. The film was made in Israel; she was interviewing Palestinians who have been displaced; I realise that was a careless phrase and I notice I used it to avoid feeling something uncomfortable – I will look at this later. I was also advised to check out Helene Cixous, writer of Stigmata; Jeanette Winterson (a writer whose work I admire); and Luce and Irragary, with regard to voice. It seems this project is about voice and sound for me. This entry was posted in reconfigured documentary and tagged coincidence, documentary, empowerment, healing trauma, Helene Cixous, Jeanette Winterson, love, Luce and Irragary, Michael Winterbottom, motorcycling, paranoia, reconfigured documentary, relationships, sound, Susan Tramwell, trust, voice by Julia Fry. Bookmark the permalink.